I bought this black dress on sale from Gap a couple months ago and have since worn it about 20 times (not even exaggerating). What I love about it is I can throw this dress on and it looks effortlessly sophisticated while I’m running errands or getting lunch with a friend yet it can also be pretty dressy. I’ve worn this specific ensemble a couple times to nice restaurants for dinner. Not only is it perfect for a dinner date, or evening activity where you need to be dressy, but it’s also really comfortable and holds up well when crammed into a carry-on bag with 14 other outfits (and I speak from experience hee hee). To make this dress look more dressy (and to add warmth in air conditioned rooms) I added a sweater in black and white. I like black and white because it’s a sharp combination and adds interest to an otherwise basic black. This sweater also has an asymmetrical hemline so I feel like I channel that “California cool” vibe when I wear it with this dress. 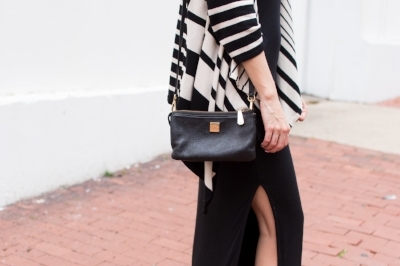 If you don’t have a black and white sweater, don’t fret! You can still achieve this look by throwing on another sweater or jacket in a neutral color (like tan/brown). I’ve done that before too!